It’s nine o’clock Monday morning. You’ve arranged for today’s after-school pick up with your spouse, coordinated lunch with a friend, scheduled a meeting with your boss, and made friends with the new coffee barista. Congratulations – you’ve already completed four successful negotiations! Every human interaction is a conflict in need of a resolution. Healthy relationships require give-and-take between partners. Knowing how to maneuver conflicted situations is essential to nurturing any relationship. That is the genesis of my book. It has just been released on Amazon. Everyone knows you should go into a job interview or car dealership prepared to negotiate. But what about going into your favorite shop or store, your child’s school, or your coworker’s cubicle—much less your boss’s office? Do you know how to navigate the pitfalls of these everyday interactions? In Seven Secrets to WINNING Without Losing a Friend, I share vital tools and techniques empowering the reader to better manage — even thrive in — the conflicts that arise as we go about our daily routine. Focusing on techniques such as goal setting, consensus building, and the power of persuasion, I demonstrate how to achieve the results we need every hour of every day. Providing practical advice, real world examples, and proven negotiating techniques, I merge negotiating disciplines with interpersonal communication skills to explain how we can improve how we manage conflict in our lives. 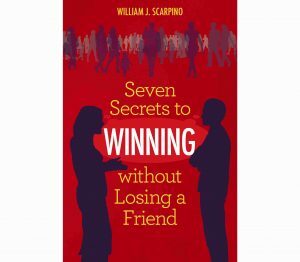 I wrote the Seven Secrets to WINNING Without Losing a Friend to help people achieve their goals, personal and professional, while maintaining healthy, personal relationships with their Rasps. What’s a Rasp? Find out in the book.